The following sample requires identification. Those with further knowledge in microbiology are encouraged to respond. If any readers believe that they are able to identify the following materials, please respond with email to info@carnicominstitute.org or post a public message on the message board. Thank you. In storage approximately 6 weeks. A fibrous appearing material is now visible within the rainwater samples that were collected on June 26 and June 27 2000 in Santa Fe NM. This is a part of the same water sample analyzed on https://carnicominstitute.org/wp/samples-require-identification/, and in which pine pollen was identified. 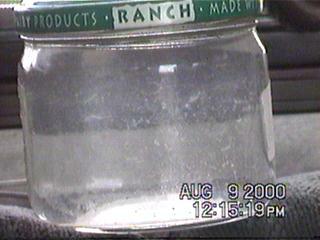 The photograph above shows the original jar which has remained sealed and in sunlight for the six week period. The jar was shaken to disturb the fibers which appear in suspension in the photograph above. 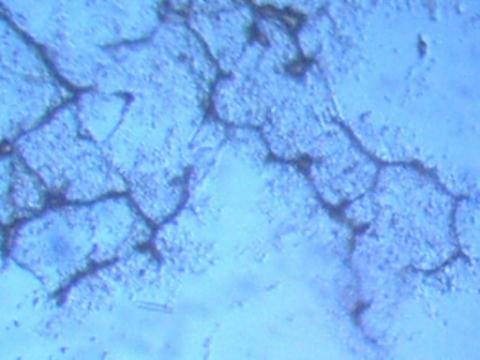 The microphotographs below show the fibrous-appearing material after it has dried upon a microscope slide. Drying of the material leads to a dendritic type structure as is seen below. 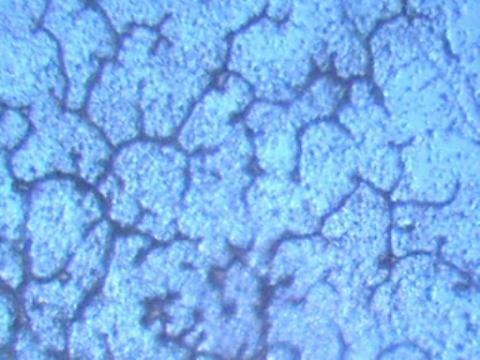 The magnification level is insufficient to show that the smallest particles which compose this material are of extremely small size, estimated at one micron in diameter or less. Both samples of rain water collected in two separate jars show the appearance of this same material, however the sample of June 26 shows a greater amount of the fibrous-appearing material.